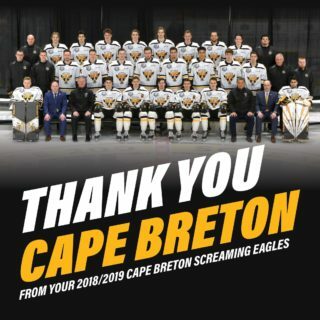 The Cape Breton Screaming Eagles play the final of their Maritime Division foes this evening in New Brunswick. 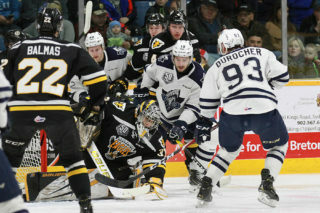 Up until this point in the season the Eagles had played each of their divisional foes aside from the Saint John Sea Dogs. That changes this evening when the two clubs clash at Harbour Station in Saint John. The Eagles will hope to continue their success from last season against the Dogs, when the Eagles won seven of nine meetings, although three of those victories came in extra time. In the last five years, the two clubs have an identical record against each other in Saint John- nine wins a piece, both twice requiring extra time to get the victory. The Screaming Eagles are embarking on a four game road trip that will take them to the province of Quebec after this evening’s contest. 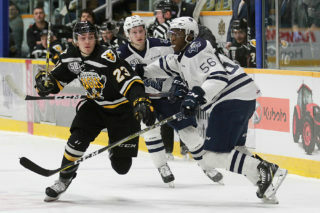 Cape Breton hopes the road could be the cure to a two game losing streak from games at Centre 200 this past week. The Eagles are 2-1 away from the Nest this season, with an overall record of 3-4 which puts the club in a tie for 8th in the Eastern Conference. Saint John trails by two points, of 1-5-2 thus far, with a record of 1-2-2 at home. While the Eagles top line of Egor Sokolov, Mathias Laferrière, and Mitchell Balmas provided the bulk of the offense on the opening weekend of the season, the attack seems to be diversifying, as the last seven Cape Breton goals have been scored by different players. 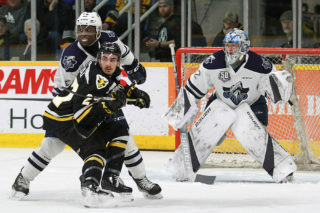 One of those goal scorers is second year forward isiah Campbell, who came over in a deal from Saint John last season, and is getting increased responsibility playing at centre in recent outings. In Saint John it’s a youth movement as the Sea Dogs are icing a roster with five 16 year olds this year, including three first round picks- forward Josh Lawrence (15th overall pick), along with defensemen William Villeneuve (2nd overall) and Jérémy Poirier (8th overall). While Lawrence actually leads Saint John in scoring, a lot of eyes are also on 17 year old Maxim Cajkovic, the winger who was the first overall pick in the CHL Import Draft. Tonight’s game goes at 7 PM, and you can catch all the action beginning with the pre-game show at 6:30 on 1270 CJCB (or online at cjcbradio.com) with Patrick McNeil. Go Eagles Go!